A 21 y o male c/o bilateral upper limb paresthesias. On examination pseudoathetosis, Poor sensation of joint position and vibrations. MRI cevico dorsal spine on sagittal sections show multisegmental contiguous T2 hyper intensity confined to posterior half of cord. 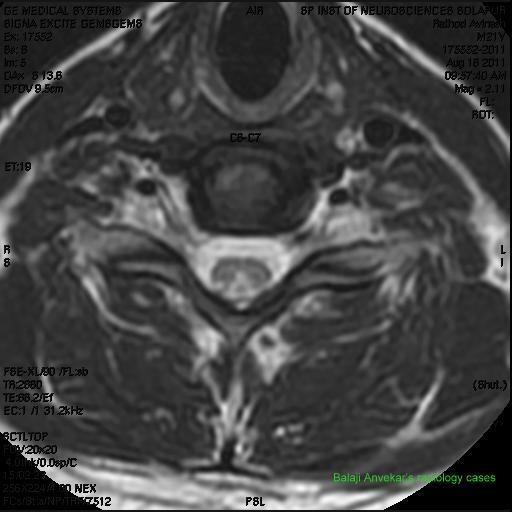 On axial sections typical inverted ‘V’ sign due to bilateral symmetrical involvement of dorsal columns. Possibility of sub acute combined degeneration of cord – Vit B 12 deficiency was suggested. Serum B12 level was abnormal 117 pg/mL (normal values 200–600 pg/mL).